Let me preface my remarks by observing that the most preferable mode of travel is always the latest model of Private Carriage, pulled by a team of prime horseflesh. Nothing matches the comfort, privacy and convenience of one’s own well-sprung vehicle! Or one’s father’s. Or one’s husband (even a husband acquired for the purpose of placating one’s father). 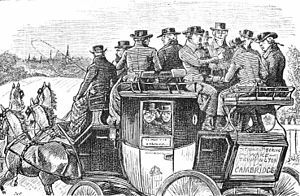 Even the personal conveyances of handsome, if overbearing, strangers met on the road often prove superior to stagecoaches, provided one demonstrates suitable breeding and does not engage in any Improper Activities suggested by said handsome stranger. At least not right away. However, let us proceed on the assumption that no personal carriage is available for one’s journey. In that case, a Lady must decide between Speed and Comfort. If her destination involves a Sickbed, Preventing an Execution, or Escaping an Unwanted Marriage, one can only choose the Royal Mail. The whirlwind speeds attained by these maroon wonders whisk the intrepid traveler from London to York — a distance of two hundred miles — in a mere eighteen hours!! Truly astounding compared to the days it normally takes to travel this distance! If Illness, Death or Immediate Disaster does not figure into one’s reasons for taking to the road, or Limited Funds do, the stage coach is a reasonable alternative to the Mail. Indeed, this choice offers many advantages over the Mail. For one thing, stages nearly all run during daylight hours. And besides the decreased cost, stage coaches stop more frequently, and for longer periods of time. True, the passengers are at the mercy of each hostelry in the manner and quality of food and beds (for overnight stops), but many inns take pride in offering tasty meals and comfortable lodging. A lady with any kind of breeding guards her behavior when visiting even the most respectable establishment, even if forced by circumstance to travel without a chaperone. She will not visit the taproom unless carried into one in a dead faint, preferably by a strapping male from a Good Family. It is to be hoped that in such a case, the inn’s host will offer the use of either a private parlour or at the very least a bedchamber for one’s recovery. Although the male in question cannot, with propriety, enter either of these rooms with her, it might be acceptable, if he speaks like a gentleman and is quite good-looking, for her to join him for dinner. Particularly if it seems likely that he owns a carriage and horses of his own. You’re most welcome! I had fun writing it! Glad you enjoyed it., Cher!